A women reads a closed sign in a KFC restuarant window in London. KFC IN THE UK will be forced to destroy tonnes of its undelivered chicken as several charities say they are not in a position to accept it. The restaurant chain is still struggling to overcome a delivery crisis that broke out after it switched delivery partner to DHL last week. The logistics firm had been storing all KFC chicken in a single unregistered cold storage warehouse. KFC said some poultry at the depot would have to be destroyed. When asked on Twitter whether thousands of tonnes of chicken would end up in landfill, the company said it is inevitable that some chicken will be wasted but it is trying to donate the food to charities. However homelesness charity Centrepoint was one of many who said it would not be able to accept the chicken as it is not equipped to handle it. “KFC’s heart is obviously in the right place, but most charities do not have the logistical capability to safely transport, store and prepare such a large quantity of fresh food,” Paul Noblet, its head of public affairs, told The Guardian. The sentiments were echoed by several other charities who said they can only accept long-life food items such as tins and packets. Mary McGrath, the chief executive of FoodCycle, urged KFC not dump any waste chicken. “They should be giving it further up the food waste chain,” she explained. There is a food waste hierarchy: you give to people first, then you give to animals; the next layer down is anaerobic digestion, when it is sent to a digester that will ferment the food and turn into energy, then there’s composting and then you are at landfill. Most of KFC’s 900 UK restaurants have now reopened as supply lines have been restored, but the company said some will remain closed for the rest of the week. 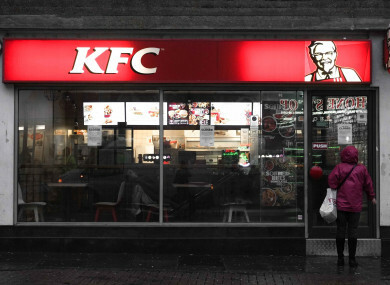 The outrage that erupted in the wake of the so-called “KFC crisis” prompted police in London and Manchester to urge the public stop contacting them about restaurant closures. “It is not a police matter if your favourite eatery is not serving the menu that you desire,” Tower Hamlets Police said. For those who contacted the Police about KFC being out of chicken ... please STOP. Their website says the Prestwich store is now open if you want to follow the four police cars through the drive thru ..
Email “KFC forced to destroy chicken as delivery fiasco rumbles on”. Feedback on “KFC forced to destroy chicken as delivery fiasco rumbles on”.